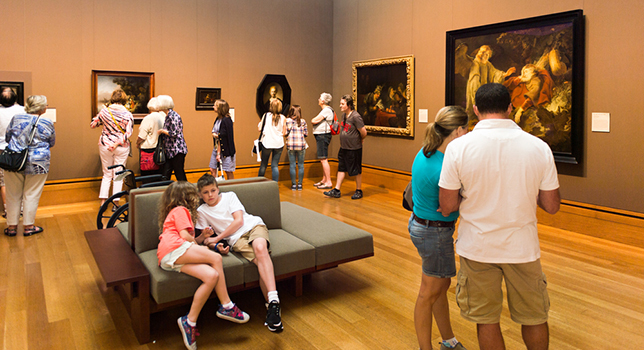 Can a single visit to an art museum impact the minds and hearts of K–12 students? That is the question on the minds of a couple of national arts organizations as they launch a national research project aimed at determining the cognitive and emotional values of art museum field trips. The National Art Education Association (NAEA) and the Association of Art Museum Directors (AAMD) are partnering to collect data over multiple years at six art museums across the country. “Our hypothesis is that engaging directly with original works of art within the distinctive physical setting of art museums, during guided programs that use constructive and inquiry-based pedagogies, can nurture a series of competencies among a series of interrelated domains — cognitive, experiential, affective, social and academic,” said Deborah Reeve, executive director of NAEA, and Christine Anagnos, executive director of AAMD, in a prepared statement. The study will include a control group and two treatment groups. The control group will not have experienced a single visit to an art museum or an in-classroom art lesson. One treatment group will have an in-museum experience, and the other treatment group will have an in-classroom experience. Data from all three groups will be analyzed to determine experiential differences among them. What does research tell us about how students benefit from experiences in art museums that take place during the school day and that also involve significant engagement with original works of art? In what ways do constructivist and inquiry-based pedagogies underpin current theories and practices in American art museums related to K–12 field trip programs? What is known about the way in which a series of interrelated competencies — critical thinking, creative thinking, sensorimotor and affective response, human connections and empathy, and academic connections — might be nurtured through encounters with works of art in the museum setting? What is the value of single visit “field trips” and what constitutes effective practices? Where does a field trip begin and end? The initial phase of the primary research will be complete in the first half of 2017, according to a news release. For more information about the NAEA, visit the organization’s website. More information on the AAMD can be found on that group's site.